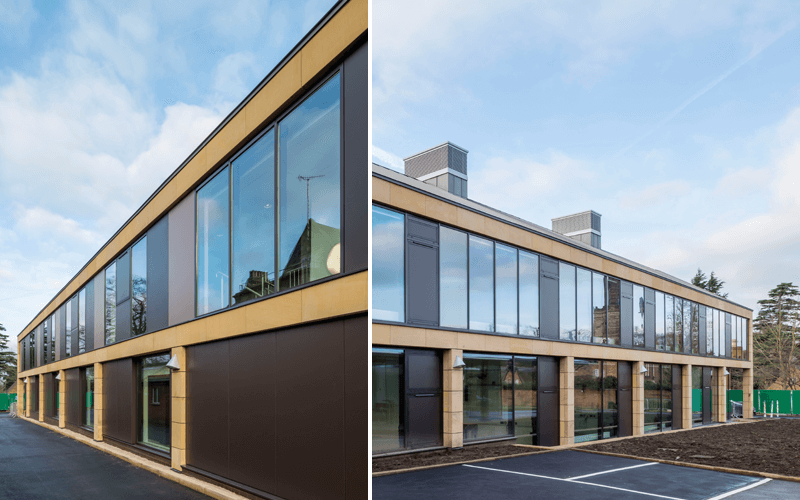 NVELOPE, the rainscreen cladding support specialist has supplied its NV3 system to a new build Maths and PE teaching block at Repton School in Derbyshire. The 'Repton Precinct', which replaces an old demolished building, features cladding support by NVELOPE's NV3 concealed, mechanical fixing system. Repton School, a co-educational English independent school, required the new two storey teaching block to mediate well between the award winning 400 Hall building, and the historic school buildings in the wider Repton campus. Derby-based main contractor B&K Building Services appointed specialist rainscreen installer A2O Cladding to install the rainscreen cladding on this project. A2O Cladding worked alongside the project architect Franklin Ellis Architects to develop the detailed design for approximately 400m² of Trespa Meteon and Aerolite vertical cladding. This included the specification of NVELOPE's NV3 system to support the rainscreen systems. An original sandstone effect was achieved by installing TI Aerolite, while Trespa Meteon was used to create a more modern look. NVELOPE's NV3 versatile cladding support system was the ideal solution for this project, as the brackets bear the weight of the cladding, absorbing the dead loads and the wind loads, which allows for adequate expansion and contraction. "We required a cost effective system which would neatly support the cladding, without disrupting the aesthetics of the building's envelope" says Tim Gray, Project Director, A2O Cladding. "The NV3 system allowed us to install the cladding with concealed fixing, giving the department a seamless finish whilst maintaining its stunning appearance." This scheme utilised the NVELOPE online 'Project Builder' design and pricing service, which provides a complete, project specific cladding solution for architects with a very fast turnaround. The 'Project Builder' design and pricing software by NVELOPE can speed up the cladding specification process for contractors, providing them with a bracket layout and an indicative m2 rate to meet their precise requirements. The NVELOPE materials used were manufactured from extruded aluminium alloys conforming to BS EN 573-3 and production BS EN 755. For further information on NVELOPE Rainscreen Systems, call us direct on +44 (0)1707 333 396.